Physiotherapy, Esoteric Connective Tissue Therapy, Esoteric Craniosacral Therapy, Esoteric Massage and Esoteric Healing. 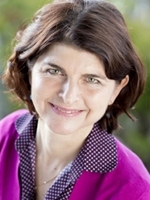 Kate offers treatments as well as group presentations on the role of the connective tissue in Sydney, Melbourne and at the UniMed clinic. For more information regarding her schedule you can email her. Kate has been a practising physiotherapist for over 25 years. Early on she worked with sporting teams and on sports injuries and then further specialised in complex spinal and pelvic conditions. In the 90's Kate worked and studied overseas and learnt craniosacral therapy, a less imposing and more holistic way of helping the body recover from trauma and injury. Since 2002 Kate has been a practitioner at the Universal Medicine Clinic in Goonellabah NSW. Over the last 8 years she has focussed more on the connective tissue, the body's soft tissue framework – vital for expansive, fluid and pain-free movement as well as balanced posture. Kate's main body of work now is Connective Tissue Therapy, which was inspired and developed by Serge Benhayon – Founder and Director of Universal Medicine. Connective Tissue Therapy is a gentle hands-on therapy that helps restore the whole body to its natural flexible flowing state. It restores the balance of the organ systems as well as the physical framework and thus, is an important key to the body's energetic vitality. Connective Tissue Therapy is also a great support to the fundamentals of Esoteric Healing – the other gentle hands-on modality that is part of Kate's work. Her treatments also incorporate gentle exercises specific to the body’s connective tissue needs with specific strength work to maintain the balance the body has been restored to. In this way, a person’s body is assisted and supported to return to its natural harmonious and balanced state from the inside out. Please book by calling the clinic on 6624 3706 – if it is an emergency or you need to clarify something with Kate please call her mobile on 0418270563. Overseas clients can email for bookings. Remedial Massage;lymphatic drainage, joint loosening, relaxation massage, stuctural alignment. Esoteric Bodywork – Esoteric Massage; men's massage; spinal, joint alignment and back therapy; specialised women's bodywork; kidney and lymphatic massage. Practitioner of Universal Medicine Therapies - Esoteric Chakra-puncture, Esoteric Massage, Esoteric Healing, Esoteric Connective Tissue Therapy, Specialised Women’s Health - Esoteric Breast Massage, Rejuvenation Retreats.